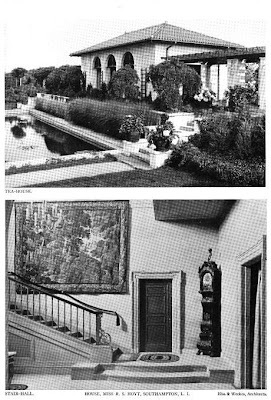 'Red Maples', the Alfred William Hoyt estate designed by Hiss & Weekes c. 1908 in Southampton with landscaping by Ferruccio Vitale. Alfred Hoyt was a founder along with his father of A.M. Hoyt & Co., investment bankers. He died of typhoid in the middle of construction of 'Red Maples' and the house was completed by his mother and sister, both Rosina Hoyt. The estate was demolished in the 1940s. Click HERE and HERE for more on 'Red Maples'. A really well done house & landscaping; like so many others it deserved to survive. Perhaps one day we'll see more interior photos. The only thing that distracts me in these photos is that door at the bottom of the stairs -- it leads to the butler's pantry. Of course the door is necessary but, because it's in such a prominent position I would have tried to hide it in a mural or tile work ... or something. Not many American millionaires die of typhoid these days. I wonder what percentage of LI estate builders died before their houses were complete or within a year of moving in? Probably because many built their homes after they had achieved great business success and were already well into their golden years when they started building their dream homes. Also todays mansion builders tend to be in their late 30's and early 40' with young families in contrast to the older Gilded Age builders. It also is strange to see how many 20 somethings have made huge fortunes and purchase or build a large home and only furnish and live in 1 or 2 rooms. Alfred Miller Hoyt was one of the original Montauk Association proprietors, and I believe his house still stands. He also at one time owned most of the land that subsequently was made into the surrounding park. 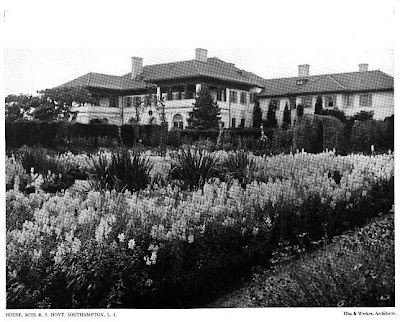 Hoyt's mother and his younger sister finished the house and installed the gardens, but they probably spent no more than a six weeks a year there. After the mother's death, her heirs rented the property out for a few years, and then sold it. why hide it? It makes a strong statement where one is needed, and the butler needed a path to the front door without having to go around the drawing room after all. I bet I'm the only commenter here who this very morning sat on a huge Directoire sofa that was once in this house. This floorplan is different from the one in Houses of the Hamptons- I wonder which one is correct? Very good of you to notice.I pondered a lot as to why the bigger floor plans, didn't match many of the room views. In the book, Houses of the Hamptons, 1880-1930, by myself and Anne Surchin, we reviewed many different views of the house from different eras and none ever matched the floor plan. I wasn't till we noticed the site plan that, the interiors worked as photographed. If you have a copy of the book, we explained it in more detail in there. During design and construction even today, many things change. It is a mystery as to why it was changed, but as the house was started by the son, his mother or sister may have altered the plans. 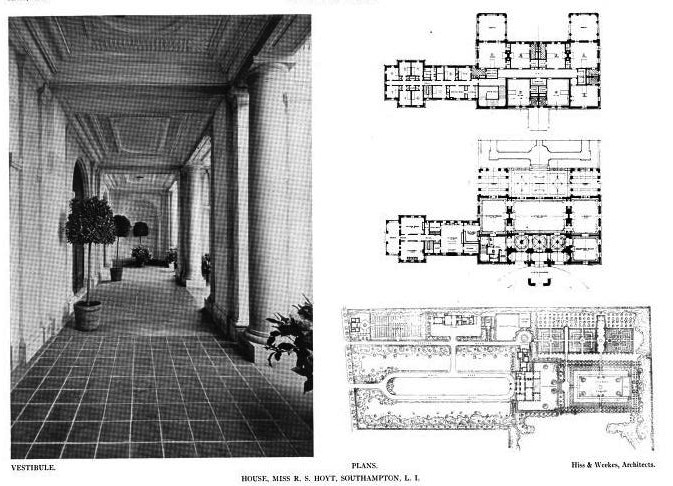 The larger plans are more consistent with such a house, since they are very symmetrical.The way it was built, was not typical of a house of that era. I will try to post some more photos soon, to explain it better on my blog. As with all books, there are many images that get discovered during research, but only so many can be used due to space limitations. Gary, I'm already swoooning over that which I've seen of this house, so please do give us more, post haste! And DED, since this house seemed to be so adroitly composed of all the right stuff, your sofa is sure to be spectacular! Was it from the Marjorie Merriweather Post days or before? Directiore is a personal favorite, so here's hoping you'll link us a pic, perhaps? The Hoyts took the furniture and art with them when they left. Even some of the garden fixtures, which were employed elsewhere. Barnabus Collins--the sofa is not mine, but belongs to friends. It was given them by the son of John Thomas Smith, the second owner, and was part of the Directoire moderne redecoration by the Smiths. The scale is HUGE. I remember riding past the site of Red Maples, and said son describing to me what it was like to enter the house the first time after his father bought it---he said that everything was Brobdingnagian, scaled way up from normal proportions---very much a supersized house.